Jackie had been a long time patient of Dr. Furey. The first time she saw Dr. Elizabeth, it was for a severe toothache. Unfortunately, the ache was coming from the progression of decay on her upper front teeth that were the anchors for her bridge. Saving the teeth wouldn’t be easy, but to do so, Jackie needed root canal treatment and a new bridge. Jackie was concerned about needing to have her bridge replaced, but wanted to make the best choice for her oral care long-term. Jackie wanted to try to keep her natural teeth, if possible. However, a short time after referring Jackie to have a root canal done, Jackie’s original bridge ended up breaking off and her teeth were fractured at the gum line and no longer restorable. This required Dr. Elizabeth and Jackie to change the course of action and it was decided that an implant bridge would be more stable and predictable long-term than relying on natural teeth for an even longer-span natural tooth bridge. Since Jackie’s original bridge had fractured at the gum line, Jackie needed an immediate solution to buy time until she could undergo her implant surgery. Dr. Elizabeth fabricated a retainer with a temporary bridge to replace her smile for the short-term. This option also gave the oral surgeon, Dr. Andreasen, access to remove the broken roots and place two implants for the anchors for her new implant bridge. Jackie was able to transition into a temporary implant bridge that hooked into her implants so she no longer needed to wear the retainer all the time. After a few months of healing, Jackie had impressions taken by Dr. Elizabeth and her new implant bridge was finalized. Jackie was very excited to finish her treatment and move forward with a healthy beautiful smile. She was able to choose which shade she wanted and she wanted a nice bright color for her front teeth. Jackie is so excited that you can now see her front teeth when she smiles! Jackie made a big commitment in going through the implant process, but she knows it was worth it because now she is decay free and is able to trust her implants for eating. Congratulations Jackie! From consuming sugary foods and beverages to chewing on crunchy or tough foods, from lifestyle choices such as smoking to poor oral hygiene, year after year our teeth endure a tremendous amount of abuse. It’s not surprising then that they manifest signs of wear and tear. Here are some common issues aging teeth often encounter…and some effective solutions that Eggert Family Dentistry offers to help you regain that youthful smile. People often feel self-conscious about their not-so-pearly whites and resort to closed-mouth smiles. Over time and on account of richly hued and acidic foods and beverages or smoking, white teeth often lose their luster. In most cases, teeth whitening is an effective solution, and while the results aren’t permanent, they’re easy to maintain. If your teeth are severely discolored, Dr. Elizabeth or Dr. Jeff may determine that porcelain veneers are the best option for you. In this case, a thin layer of porcelain is bonded to the front of the tooth for a bright, natural transformation. General tooth wear occurs over time. This can make teeth appear shorter and uneven. Two effective methods of reshaping and reforming teeth are porcelain veneers and crowns. In some situations, enamel shaping with a dental handpiece can help smooth out jagged edges. A lifetime of consuming sugary foods, frequent snacking and inconsistent brushing and flossing all lend themselves to tooth decay, a precursor to cavities. Good brushing and flossing habits as well as prescription strength fluoride products can ward off this decay. If cavities form, Dr. Elizabeth or Dr. Jeff will recommend fillings or crowns to prevent this decay from reaching the nerve and to restore the integrity of the tooth. Affixed to the adjacent teeth, bridges ‘bridge’ the gap created by the missing tooth with artificial, yet natural-looking, teeth. Most similar in appearance to natural teeth, dental implants are anchored to the jawbone and provide a solid base for supporting artificial teeth, or crowns. In situations where you’ve lost most or all of your teeth, dentures may be your best treatment option. Eggert Family Dentistry is experienced in caring for aging teeth. Trust us with yours! If you would like to arrange a consult, give us a call at 651.482.8412. 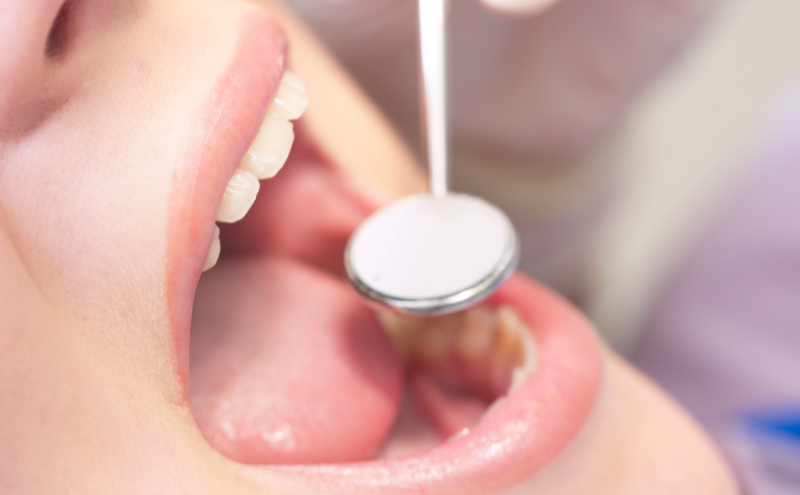 Gum disease is serious and can have a ripple effect on a person’s health. Complications from gum disease can look different for men and women. At Eggert Family Dentistry, we recognize the destructive nature of gum disease on both men’s and women’s health. With this article, we will spend time educating our female patients as to some of the best methods of preventing serious health problems. How does gum disease affect a woman’s body? The heart: Gum disease increases the risk of heart disease which is already the number one killer of U.S. women. The likelihood of a fatal heart attack doubles when gum disease is present. The lungs: Bacteria can travel into the lungs increasing the risk of pneumonia. The brain: Oral infections increase the risk of stroke. Blood sugar: Gum disease increases the risk of diabetes in healthy adults and people with diabetes are more prone to gum disease. Gum disease in women can also increase pregnancy complications resulting in premature birth and low birth weight. Hormones fluctuate during different phases of a woman’s life. These fluctuating hormones can affect the gums and the way a woman’s body responds to plaque. In the days leading up to a woman’s monthly cycle, many women report tender, swollen gums. Irritated gums can attract and harbor plaque. Women who take oral contraceptives often report inflamed gums which make them more prone to plaque build-up and gum disease. During pregnancy, many women experience pregnancy gingivitis which manifests itself with red, inflamed, bleeding gums. This is due to the presence of plaque and harmful oral bacteria. Menopause can induce red, inflamed gums and oral discomfort, creating an inviting environment for plaque and harmful bacteria. Eggert Family Dentistry wants to partner with you to achieve and maintain healthy gum tissue during every phase of your life. Daily brushing and flossing as well as regular recare appointments are not only an investment in your oral health but in your overall health as well. If you’re interested in scheduling an appointment with us, Dr. Elizabeth and Dr. Jeff can be reached at 651.482.8412. As we touched on in our last post, the fluctuation of a woman’s hormones throughout the many seasons of her life greatly impacts the likelihood of developing gum disease and other serious health conditions. At Eggert Family Dentistry, we want to educate you on the subject so you have the tools you need to achieve optimal dental and overall wellness. 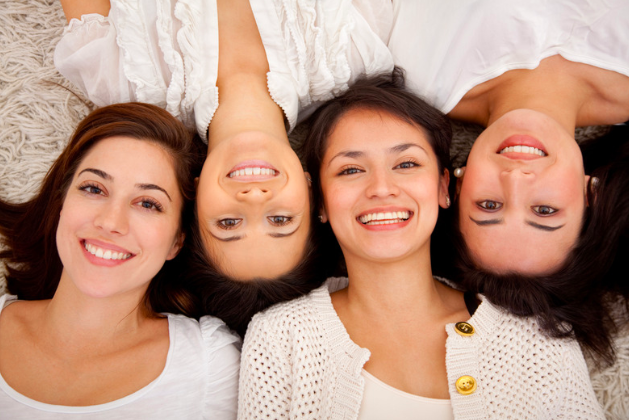 Let’s take a more in-depth look at the role hormones play in a woman’s dental health throughout her life. During puberty, a teenage girl may complain of red, swollen and bleeding gums and even an increase in canker sores. This is perfectly normal and is caused by an increase in estrogen and progesterone which cause an increase in blood flow to the gums. On account of increased blood flow, the gums can become more sensitive and irritated and more prone to plaque and bacteria. In addition to regular dental recare appointments, flossing once a day and brushing twice a day with fluoride toothpaste is highly beneficial. It will help thoroughly clean the teeth and gums and keep plaque and bacteria from building up and causing problems. Leading up to their monthly cycle, many women experience oral irritation. These symptoms should subside after menstruation stops and include swollen, tender, bleeding gums and cankers sores – very similar to what the teenagers experience. Again, consistent brushing, flossing and fluoride use will help ward off gum disease and consequent health problems. Pregnancy is another season of a woman’s life when hormone levels surge, oftentimes causing pregnancy gingivitis – a mild form of gum disease. In addition to regular brushing and flossing, dental visits during pregnancy are not only safe but they are incredibly beneficial. Women are particularly sensitive to pregnancy gingivitis between months 2-8 of pregnancy. This is a great window of time to come in to Eggert Family Dentistry for a recare appointment. Menopause is yet another season of vast hormonal changes in a woman’s body. However, instead of an increase in hormone levels, menopause marks a sharp decrease in the production of estrogen. Two of the most common hormonally induced changes during this time are dry mouth and bone loss. Dry mouth: Saliva cleanses the mouth of cavity and gum disease-causing bacteria. During menopause, when a woman experiences dry mouth, bacteria can more easily build up and can increase her risk of developing cavities and gum disease. Sucking on sugar-free candy, drinking plenty of water and using over-the-counter mouth spray can help combat dry mouth and promote dental health. Bone loss: The decrease in estrogen levels during menopause can result in bone loss, even bone loss in the jaw. One telltale sign of bone loss affecting the jaw is receding gums. When gums recede, more of the tooth is exposed and the risk of cavities and tooth decay increases. Proper intake of calcium and Vitamin D can help curb bone loss and reduce the risk of decay. At Eggert Family Dentistry, we believe that good dental health starts with the basics. Thorough daily brushing and flossing as well as routine dental exams help lay a solid dental foundation for a lifetime. It’s also important for women to remain mindful of their dental health during the various hormonal seasons of their lives. If you want to learn more about how female hormonal changes affect dental health or to schedule a routine dental exam, Dr. Elizabeth and Dr. Jeff can be reached at 651.482.8412. Full Mouth Reconstruction – Am I a Candidate? There are times when, even with diligent touch-up work throughout the years, a person could truly benefit from full mouth reconstruction. This reconstruction process involves restoring all the teeth in both the upper and lower jaw and oftentimes correcting the bite and healing the gums. At Eggert Family Dentistry, when we undertake full mouth reconstruction, we work closely with periodontists, oral surgeons, orthodontists and endodontists as needed to achieve optimal results for our patients. If you’ve experienced tooth loss, decay or trauma to your teeth, have teeth that are worn down from years of acid erosion or teeth grinding, jaw, muscle or head pain that stems from improper positioning of the jaw and ultimately want to improve the aesthetic of your teeth and regain your confident smile, you may be a candidate for full mouth reconstruction. Each patient is different and maintains a unique set of dental challenges. On this account, each treatment plan is unique as well. However, all of our patients maintain one common goal: to achieve a healthy, comfortable and attractive smile. At Eggert Family Dentistry, we start by thoroughly evaluating your specific dental situation. We inspect teeth, gums, muscles and the jaw. 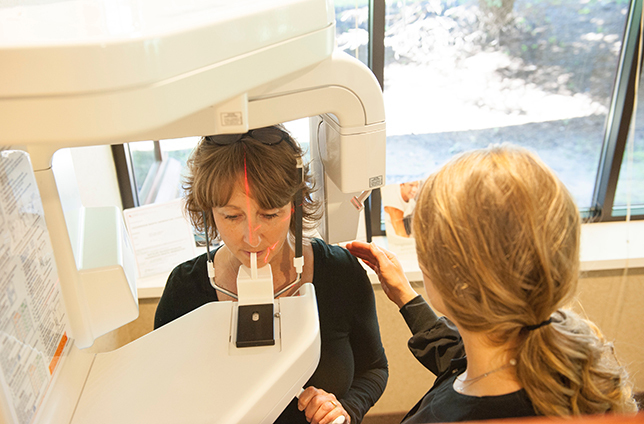 We do this through the use of impressions, photos and x-rays. Is your bite even or is it uneven and uncomfortable, causing wear and deterioration of your teeth? Which teeth are cracked, worn or in need of repair? Do you have any missing teeth? How about your gum health – is there any sign of periodontal disease? Dr. Eggert then puts together a comprehensive “tour” of your mouth and walks you through different treatment options. 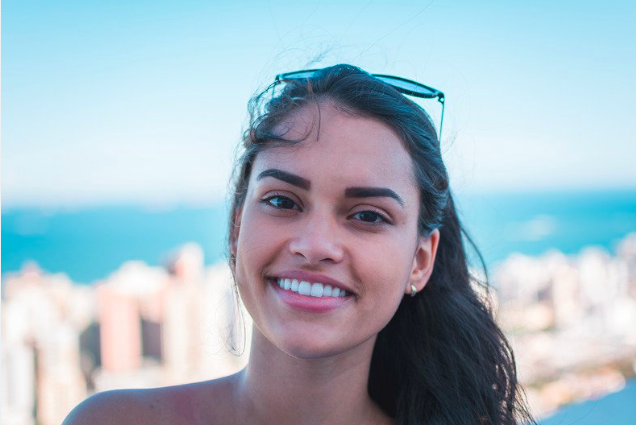 If a full reconstruction is warranted, treatment may include procedures such as veneers, crowns, fillings, inlays, onlays, scaling and root planing, orthodontic attention for bite correction…the list goes on. If you decide to proceed with a full reconstruction, Dr. Eggert will refer you to any specialists that will be involved in your case, confer with them on their findings and create a step-by-step treatment plan to correct all dental issues and accomplish your reconstruction. This process can take 12 months or more as it requires a series of appointments – often with a handful of dental professionals – but the results of full mouth reconstruction cannot be underestimated! Your investment in dental wellness will vastly improve your oral health and boost your self-confidence. You really can be comfortable in your own skin and have a smile you want to share! Richard, one of our patients at Eggert Family Dentistry, is a testimony to the power of a reconstructed smile! Read his story here. If you’re intrigued by the idea of full mouth reconstruction and think you may be a candidate, we would be happy to sit down with you and discuss your individual needs. We can be reached at 651.482.8412. Posted on January 23, 2019 January 23, 2019 Categories Full Mouth ReconstructionTags Bonded Restorations, Common Questions, Cosmetic Dentistry, Cracked Tooth, Dental Industry, Eggert Family Dentistry, Minnesota Dentists, Missing Teeth, North Minneapolis Dental Clinic, Patient Stories, Services, Smile Solution, Technology, Teeth Whitening Oakdale, VeneersLeave a comment on Full Mouth Reconstruction – Am I a Candidate? The same degree to which a less-than-perfect smile can have a negative impact on a person’s self-esteem, a straight, bright white smile can have a positive one. Fortunately, if you’re in the former camp and long for a more confident smile, Eggert Family Dentistry can help. One effective solution for addressing a variety of dental imperfections are veneers. Let’s take an up-close look at veneers so you can decide if they’re right for you. Veneers are thin ceramic shells that cover the front of the natural teeth in order to hide stains, cracks, chips or gaps and serve to improve the appearance of misaligned teeth. Veneers are one of the least invasive cosmetic procedures available and are considered a permanent solution that can last for decades with proper care. If Dr. Elizabeth or Dr. Jeff agree that veneers are an effective choice for helping you achieve your ideal smile, you will embark on a series of three visits. At the first visit, Dr. Elizabeth or Dr. Jeff will discuss your goals with you and together you will envision the shape and look you are striving for. At this time, we will also outline your individualized treatment plan. At the second visit, Dr. Elizabeth or Dr. Jeff will prepare your teeth to receive your customized veneers by removing a thin layer of outer enamel, taking an impression of your prepared teeth and providing you with a stunning temporary solution. At the third visit – two to three weeks later – Dr. Elizabeth or Dr. Jeff will place your veneers. We work hard to ensure that your permanent veneers look and feel just like your natural teeth. After placement, we will provide you with follow-up care instructions. After Dr. Elizabeth or Dr. Jeff prepare your teeth for your veneers and provide you with a temporary solution, it’s perfectly normal for your gum tissues, teeth and jaw to be sore for a few days. Rinsing with warm salt water multiple times a day and taking over-the-counter pain meds should help alleviate any discomfort to these areas. We also encourage you to brush and floss in order to expedite tissue healing. Because the temporary splints your teeth together, you must use a floss-threader or a Waterpik. Also, avoid hard, crunchy foods as your temporary is just that – temporary! – and doesn’t maintain the integrity of actual veneers. Similar to your post-preparatory experience, after you receive your veneers you may incur mouth soreness. Rinse with warm salt water, take over-the-counter pain meds and brush and floss frequently. Avoid scrubbing the gumline while brushing in order to avoid gumline recession. When gums recede, the junction of the veneer and natural tooth is exposed and can be unsightly. Just like natural teeth, veneers are prone to staining. Limit or avoid coffee, tea, red wine, berries and other acidic or highly pigmented foods and brush thoroughly after consuming them. Also, it’s best to avoid smoking as nicotine can stain veneers. Lastly, keep in mind that applying excessive force to your teeth via nail biting or consuming hard or crunchy foods can occasionally cause a veneer to pop off or become damaged. Veneers are adhered with a strong bond but also must be treated with care. In the instance you experience nerve pain following either your preparatory appointment or your veneer placement, contact our office right away. On rare occasions, particularly on teeth with large fillings, deep decay or previous cracks or fractures, nerves can become irritated and additional procedures on that tooth may be required. At Eggert Family Dentistry, we succeed when you leave our office with a confident smile! If you long for a smile you want to show off, give us a call at 651.482.8412. We would love to discuss some great options with you and see which one helps you best achieve your goals. Lasers are increasingly common across nearly all fields of medicine and dentistry is certainly not excluded. 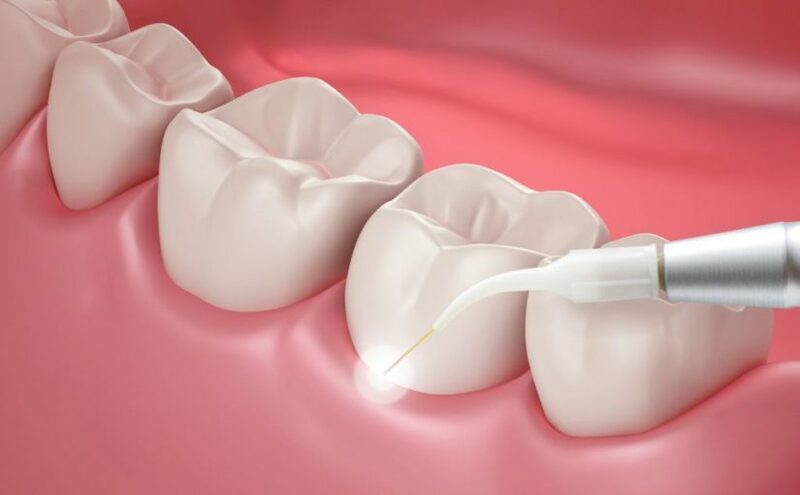 Delivering energy in the form of light, laser dentistry procedures are incredibly precise and minimally invasive, making them a popular choice among practitioners and patients alike. At Eggert Family Dentistry, we utilize lasers in a number of procedures to the benefit of our patients. Dr. Elizabeth and Dr. Jeff implement laser dentistry to treat issues including overgrown gum tissue, gum disease, tooth decay and root canals. We also use lasers when teeth whitening to activate the bleaching solution and speed up the whitening process. Additionally, laser dentistry aids in exposing wisdom teeth and removing benign oral tumors. Hard tissue lasers: These lasers cut through both water and bone and are effective for procedures such as detecting cavities and preparing teeth for fillings. Soft tissue lasers: These lasers cut through soft tissue and are effective for procedures such as reshaping gums, lengthening crowns and performing biopsies. When you come in for a laser dentistry consult, Dr. Elizabeth or Dr. Jeff will share with you all the benefits of laser dentistry. These benefits include less bleeding, reduced likelihood of infection, diminished need for anesthesia and reduced healing time. Also, you won’t feel discomfort from the laser like you may from a drill. For this reason, laser dentistry can be a good choice for children who are fearful of the noise and pressure of the drill. Furthermore, our patients who undergo laser dental procedures report less discomfort during the recovery process than following scalpel procedures. If you would like to learn more about our laser dentistry services here at Eggert Family Dentistry, give us a call at 651.482.8412. We would be happy to discuss this further! Have you or someone you know ever considered a career in dentistry? There are nearly 200,000 practicing dentists in the United States as well as hundreds of thousands more people working as dental hygienists, assistants, administrators, and lab technicians who are enjoying fulfilling careers, competitive salaries and a quality work/life balance within the dental industry. The ADA recognizes nine specialties within the industry: dental public health, endodontics, oral and maxillofacial pathology/radiology/surgery, orthodontics and dentofacial orthopedics, pediatric dentistry, periodontics, and prosthodontics. Typically, DDS/DMD programs are four-year programs. Dental specialties require additional years of study above and beyond those four years. With over 65 dental schools throughout the country, dental school is highly competitive and requires a substantial financial investment. In fact, over 90% of dental students finance their education through the use of student loans. Eggert Family Dentistry is invested in the future of dentistry and believes that the cost of dental education shouldn’t prohibit anyone from pursuing their dreams. This is why, since 2005, Dr. Eggert has been making a difference in the lives of countless young people by awarding $2000 each year to four high school seniors from the following local schools: Mounds View, Irondale, Centennial and Spring Lake Park. The goal of the scholarships is to get them in the hands of students pursuing a career in the dental industry. This means not only students planning on becoming a dentist, but the scholarships are given to future dental assistants, hygienists, and lab technicians as well. There are currently many opportunities in the dental industry, especially for axillary team members. If you know a well-deserving senior from one of these schools that you would like to nominate for an Eggert Family Denistry scholarship, submit one to two paragraphs about why you believe this person should be awarded the scholarship. All nominations must be received before March of each year. Scholarship winners will join the ranks of these fine former recipients. If you would like to know more about careers in dentistry, we would be happy to speak with you! Or, we have had students shadow at our office in the past as well. This is a great way to learn more about this exciting career path. Call us at 651-482-8412 to set something up.